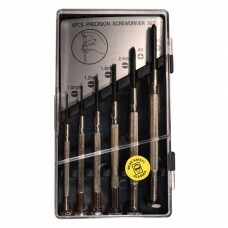 This 6 Piece Precision Screwdriver Set comes in handy when working with robots and other electronic projects. This set contains 4 small slot head screwdrivers from 1mm through 2.4mm and two Philips head screwdrivers in size #0 and #1. Each precision screwdriver contains a swivel bottom to assist with single handed operation. This set comes in a convenient plastic organizer case.